Assumptions can be fairly accurate and good or very inaccurate and very bad. I recently ran across a very bad assumption. A family living in a southern state was found through an obituary in a small town newspaper. That is normally good news but the assumption that was made was that they lived in the town where the newspaper was published. Bad assumption. Why? Because they actually lived in the same county but a few miles away in a different town. The bad assumption came from the wording of the obituary that named the deceased and said that the deceased lived "in this county." But the researchers put the death place as the county seat. Why was this a bad assumption? Because they couldn't find any relatives in the county seat. They all lived way out there in the country. In this case, the problem was almost fatal and had caused a "brickwall" situation for years in the family's research. After the fact, the solution seems obvious, look further in the county for the family. The place where the family was living actually shows up on U.S. Census and no where else, apparently. It does not even show up as a town listed for that county. Now, why don't I just give you the concrete examples as evidence? First, this isn't my family. My conclusions at this point might be entirely bogus. I don't think so, but if I put out the names and my conclusions and then my conclusions turn out to be wrong, how many people will have already copied my incorrect work into online family trees? I'm not cynical or anything, I speak from personal experience. So how do we avoid assumptions? Hmm. This sounds like it might get back to the Genealogical Proof Standard. Yep, it does. I think we are making a circle here, I am back to the issue of believing information without proper citations or a reasonably exhaustive search of the records. In the case I cite above, I do not have all of the research the family has done, I just might be re-plowing the field. Why don't I think this is the case? Because with the additional relatives I have found, it is likely that one or more of them can be traced back to the unknown parent. If the family had already checked out all these names, they likely would have already solved their original brickwall question about the identity of the parents of the deceased. What was the key here? Re-reading the records and asking questions about the information already gathered. No new information was required to crack the code, they already had enough, they just didn't carry it out far enough. Don't get me wrong, I didn't find the parents. Yet. But I am reasonably sure what it will take to find the parents. Will everything I tell the family to do finally answer the question? Possibly yes, possibly no, but they can no longer claim brickwall status for the ancestor because now they have a huge number of records to search. Is this all simple and easy? Not at all. It makes my head hurt. Especially since just today, one of my genealogy friends told me that whenever I answered a question it made her feel like she didn't know anything because what I said was so complicated she had no idea what I was talking about. Oh well, live and learn. Genealogy is not easy. It is very difficult and like I said, it makes my head hurt sometimes. What do you do when your ancestors really are named John and Mary? Hope for children with unusual names? There are certain strategies that can help locate even those with common given and surnames. I would also start by giving my standard advice, find out everything you can about the next generation closer in time before you take the plunge into the morass of a common name. If I put a number of pencil dots on a piece of paper, there is apparently nothing to differentiate the dots from each other. They all look exactly the same. Except for one very important fact, none of the dots are in exactly the same location. Even individuals with identical names, even individuals that have identical names with identical names of their spouses, and the same children's names in the same order, lived in exactly the same place and time. My dots on the paper can easily be identified by overlaying the paper with a grid and identifying each dot by its location in the grid. Likewise, identifying geographic locations, even down to the name of the farm or house, might be necessary to identify an individual with a common given name and surname. So, you say, easier said than done. Yes, you are right, it is easier said than done. But it is one of the only ways to distinguish between those individuals with common surnames. Another way of distinguishing between individuals is to look at the pattern of the family. Even two families with the same names for the parents and each of the children will not likely have the children in exactly the same order (although it has been know to happen). In this extreme case, you have to focus even more sharply at slight differences in location and the ages of the children. This is a technique commonly used in Danish/Norwegian research because of the paucity of given names. You may also gain some ground by looking at other distinguishing characteristics of the person, such as, occupations, land ownership, church affiliation, and other specific characteristics. But where do you find these specifics? Sometimes they are right before your eyes in the Census records, sometimes, it may take years of searching local records such as newspapers and court records to come up with two or even one difference that divides the families into separate groups. In our instant gratification society, we don't want to postpone our reward indefinitely, so we quit. Don't quit. Don't bang your head against the wall, but don't quit. Keep looking for more records from the same location where the ancestor was definitely identified. If you don't have a definite place or date for the parents, concentrate on the first child you can positively identify. Stop trying to find the parent until you know the whole life story of the child. Look for the small clue, I once found a family by looking for a "relation" named in a will probate. The family had been looking for years and had not picked up on this clue, apparently. By looking in the general geographic area of the will probate, I found almost two dozen family members, some of which had the same names as those of the ancestor's family. This technique is a lot more productive than searching census records for people with the same name, believe me. The Family History Library (FHL) in Salt Lake City, Utah is world renowned as the largest research collection under one roof anywhere in the world! You can access their collections through more than 3,000 FamilySearch Centers throughout the U.S.
At the Atlanta Family History Expo FamilySearch and the FHL are offering to scan your family/local history book for FREE and give you a digital copy on a flash drive provided by FamilySearch for your convenience, all at no cost to you. All you need to do is bring your book with you. I understand that if this works in Georgia, the same service may be provided at the Mesa Family History Expo in January. I am a great proponent of making digitized copies of family history books available on the Internet. When I was very young, I used to ride my bike about a mile or so to the Phoenix Public Library to check out books. I usually ended up going to the library about twice a week. The procedure for checking out a library book was simple, you signed your name on the card in the front of the book. The cards for books that were checked out, were then put back in the book when it was checked in and your name was crossed out. As I got older, I could see who checked out the books before me and I could tell if I had checked the book out before (for especially forgettable books). Going to the library has become a major activity for our family over the years. During the time my own children were growing up, we took all of them regularly, checking out stack of books on each visit. The procedure for checking out books was automated slightly, when I go a library card with a metal tab with a raised number. The library equipment would run the card through a roller that would imprint the card for the book. Later, the system got more automated with library cards that were scanned by a laser bar code, but we still had a person checking each book and entering the books into a file. The next step was to have all the books with barcodes and scanned by the laser. Just lately the large check out desk in our local public library disappeared with all the employees and became a reading area. Now all of the books are checked out by putting your card on a sensor, once the card is read, you can put your books on the sensor one-by-one and the sensor reads a microchip in the book and checks the book out to you. You get a printed list of books you have checked out. Underlying these changes in way books are checked out, there is a more fundamental change occurring. I was surprised to see the latest changes in our public library for a simple reason, I hadn't been to the library for a long time. The reasons involve a radical change in the way books are created, sold and read that is impacting the traditional library. I no longer go so regularly to my local public library for a number of reasons, some of them involve the changes in the book industry others have to do with content. To be blunt, our local library does not have any books I am interested in reading. For example, I would like to read a book about Adobe Photoshop CS5. I look in the local libraries online catalogs and discover that they have several books on the subject and all of them are checked out. There is no way I can look at the books and see if I really want to get into my car, drive to the library and look at the book. I could put the book on hold, but then I still don't know if the book is what I want. What is the alternative? I could buy the book. But this is a real problem. I look on Amazon.com for the book and find that most of the books are around $25 to $30 each. But the advantage is that I can preview portions of the book and decided if I am interested. I really don't want to spend all that money on a book that will go out of date almost instantly, in addition, I don't have any more room for books in my house, they are already stacked ten deep or doubled on the shelves. Now we get to the real reason I haven't been to the library, I can buy an electronic version of the book and read it on my iPhone, iPad or whatever. What's more this works not only for current electronic topics, but for old genealogy books also. That same book that was about $30 for a print copy is about seven dollars cheaper for the downloadable copy. But do I really want to buy the book? So now I move over to Google Books. I use Google Books to look for my Photoshop CS5 book. Here is is again for about $25 to $30 and I could go around the circle again and find it in a library, but I check the what it would cost to add it to my Google eBooks. Hmm. about the same price as Amazon.com for an electronic download. Do I go back to the library and put my name on the waiting list? Wait, there are more options. OpenLibrary.org is one. Maybe I would have more luck if I wasn't looking for a book about Photoshop CS5? What about a surname book on the Tanners. OpenLibrary.org strikes out on that one. Back to Google eBooks, but this is not helpful. A search in Google Books, not the eBook program, gives me several options. But I am essentially back where I started, the library. What does this exercise tell me? Libraries are far from dead. If I wanted a best seller or a current electronics book right now, I would have to buy either the paper or electronic version. If I want to wait a while for a copy, I can put one of the copies at the library on hold. I might also be able to see a preview of the book on Amazon.com or Google Books before I put it on hold. Will all the eBook readers and tablet computers change this way of distributing books? Maybe, but not too quickly. I do understand that my local library is considering checking books out on a Kindle reader, but then again the issue is whether of not they have the book I am interested in reading. I think I am getting worn away by all the really bad genealogy I see almost every day. I feel like I am bailing the ocean with a teacup or maybe only a spoon. I realize the people who are wearing me away aren't even vaguely aware of blogs, genealogy blogs, this genealogy blog or much else in the world, but I am hoping, with a small glimmer of hope, that someone will help these poor unfortunate people overcome their really, really bad genealogy. What set me off on a rant this time? A combination of factors. Surprisingly, the non-announcement of a New FamilySearch Beta test. I started to get notices from a few people that had received invitations to participate with promises to keep the rest of us informed. Maybe things seem darkest when you can see that glimmer of hope at the end of a really long tunnel? Here it goes, today's picks for things that drive me crazy. 1. Entries on family group records without a semblance of using the shift key. Either the entries are all in capital letters or there is no capitalization at all, the entire entry is in lower case letters. I am trying hard here not to be an elitist and scorn those who do not measure up to my standards. But come on, let's be a tiny bit consistent. Anciently, back in the days of 11x17 inch paper family group records, we went through a phase where the standard was to put the surnames in capital letters. I assume this was to make the surname standout from the rest of the typing and make identification easier. Recognizing this old standard, many genealogy programs have a provision for allowing all caps or change the case to regular sentence structure. With today's programs, there is no longer any need to have surnames in all caps. If it is necessary, the surname can be marked with forward slashes. But having the entire entry in all caps or all lower case is just plain sloppy. But how can I trust someone with accurate dates and information, that can't pick up on even this small detail? OK, so do I have to make allowances for the e. e. cummings of the genealogy world? USE THE SHIFT KEY!!! Get the idea. In today's online world, all caps is equal to shouting. 3. Copying verbatim the above problems. Not only are there people who don't care enough about detail to have very sloppy genealogy, there are those who copy it all without making even the slightest effort to check the accuracy or even correct the bad typing. 4. Thinking that the only source for genealogy is the U.S. Census. I have written about this recently. You cannot believe how many people, who have supposedly been doing some kind of research activity for years, have never gotten beyond Ancestry.com and the U.S. Census. Last week I helped a patron at the Mesa Regional Family History Center find her father and grandfather on the U.S. Census. This week she came back and asked me to show it to her again, because someone who was helping her couldn't find the same entry. She thought I was magic or something because I could find her father and grandfather under their names in Ancestry.com. There was no spelling issue, they were right there under their names with wives and children listed. Let's move on folks. Start using all of the millions of other records available. 5. OK, here's today's worst. Because I swim in a sea of New FamilySearch, I have to deal with it almost every day. The issue is people who think they are doing "research into their genealogy" when they are copying user submitted family trees, without doing even a modicum of verification. My last comment for today; don't claim to have a real "brickwall" until you have read every edition of every small town newspaper in the area of your research. I have a friend who brought me a stack of research including a copy of an obituary in a small town newspaper. This person is trying to find out about the person in the obituary. When I asked her about where the obituary came from, since I have yet to find it online, she replied, someone gave it to me. That wears me away just a little bit more. She wants suggestions about where to look for more information. Here is the suggestion, look in the newspaper that had the obituary. One of the most common problem with researchers is failing to look at the context of the lives of their ancestors. Like checking off a shopping list, some researchers think they are done with their research once they have a date and a general place. I cannot tell you how many times I have seen entries people's sheets that say "George abt 1860" or "Mary, Ohio." If they have no place in their records then how do they know the name was really "George?" Or with no date, how do they know the name was "Mary?" Systems analysis is defined as an analysis of all aspects of a project along with ways to collect information about the operation of its parts. Isn't that essentially what we are trying to achieve in genealogical research? One goal of systems analysis is to form a coherent whole. Having a dangling relative with no name or no date or lacking a place is the antithesis of a functional system. So what do you do when you come to the end of your Tanner line, for example, enter Mr. Tanner as the last father? When you are that far back in time, how do you know the father's surname was Tanner? For that matter, how do you know the people had surnames? In a recent case, one of my friends came to me with a question about finding a male ancestor. She wanted help establishing that the individual was the next most remote ancestor in her ancestral line. Her question was directed towards sources. I was busy at that moment, so my wife looked at the information and very quickly pointed out that by subtracting the oldest child's birth year from the supposed father, the father would have had to have been 4 years old at the time of the child's birth. Either the dates for the father or for the child were wrong. My friend needed to move forward a generation and do more research. I viewed the basic problem to one of lack of systems analysis. My friend was failing to look at each part of her genealogy as fitting into the overall system of her family. This is a very simple example, but the idea of looking at the system and the context of the system extends much further than to looking at individual dates. It also includes looking at the communities and social context of each generation. Another example, what made your ancestor or the ancestral family immigrate? What were the social, economic or political conditions that caused the family to move to a new location? Did other family members move at the same or near the same time? Is there more information about other family members than about your own individual ancestor? Where did your ancestor "fit in" to the family? In the late 1700s some of my direct line Tanner family members moved from Rhode Island to New York. What caused the family to leave the ancestral home, where the family had lived for over 100 years, and move north to New York? You can learn about the history of the times and learn about the Tanner family and why they moved north to New York or you can learn about the Tanner family and thereby learn about the history. A family does not develop on it own. The statement I just made about learning about history is based on an interesting article illustrating this principle called "Introduction to our pages on Colonial History." If you wanted to know more about this migration pattern, you could easily find more information, for example, here is an article from Ancestry Magazine in July/August of 2000, "New England's Migration Fever: The Expansion of America" by Ralph J. Crandall on Ancestry.com. In the case of the Tanners, it is likely that, what Dr. Crandall calls, Genesee Fever, an early subdivision promotion, lured settlers out of Rhode Island into the subdivided land in New York, especially in the case of my remote grandfather who was one of the younger sons and did not stand to inherit much land in Rhode Island. My concern about the idea of dealing with families as part of a larger context or system stems from regular contact with people who are searching for names and dates and ignoring the history. I could go to the Mesa Regional Family History Center today and sit down next to some one diligently staring at a computer screen and ask if they knew anything about the place or history of the place where they were searching and only get a very annoyed look about why I was asking such an irrelevant question. What do you know about New England? or Virginia? or England? or Germany? or Denmark? or Sweden? or Botswana? or Toga? To find a person, you have to locate that person in space and time. Genealogists spend a lot of their effort defining those spaces and those times that define the identities of their ancestors. But too many take the "Holes" approach to genealogy. If you haven't read the book by Louis Sachar, maybe you have seen the movie. In the movie a group of boys in a juvenile detention center are forced to dig holes in a dried up lake bed. Unknown to the characters and the audience, the boys are really looking for a buried treasure. Now if we ignore the need to define the space and time of our ancestors, we will end up like Stanley Yelnats digging endlessly, spending a lot of effort and sweat, but getting nothing for our efforts. The movie and the book turn out well in the end, but sometimes our efforts to find our ancestors don't turn out so well. How do we keep from digging an endless series of holes in a dried up lake bed? I have a few suggestions. Place your ancestors in time and space. Where were you born? If you don't know, then that is the first step in your genealogical digging. I have said this before, but it bears mentioning over and again, your mother was there when you were born. Your grandmother was there when your father was born and so forth and so on. So how did your mother get to where you were born? By the way, the same rule does not hold true for your father, he may have been just about anywhere or even deceased when you were born. We spend a awful lot of time looking for male members of our families when it is the females that hold all the links to all the information. Some our efforts will end right there. From time to time I do work with people who do not know their parents. You may have to use a whole different set of tools to find your parents and that is another day and another story. Let's assume you know where and when you were born. That is the location and the time period where you start to look for records about your parents. At this point, you learn everything you can about the history and geography of the place you were born. The more you know, the more likely you are to find records about your family. Hmm. While you are contemplating this problem, it might be a good idea to ask your relatives for information. They might know more than your think. OK, you know who your parents were and you find out when and where they were born. Then you know where your father's mother and your mother's mother were at the time your parents were born. Now you need to find out some more about the history and geography of the area. Genealogical records are mostly located by geographic area. Now you are looking for records about your two grandmothers and you have a place and a time, the place your father was born and the time he was born and the place your mother was born and the time she was born. That is a good start. But, you say, I know all that and I am really looking for my great-great grandfather. If you are looking for your great-great grandfather, you are telling me that you don't know when or where he was born. Why is that? Because you skipped over the information and tried to get to your great-great-grandfather without ever knowing where or when he lived. If you know where and when one of his children, either male or female, were born, then you know one location and time for your great-great-grandmother and that is where you start to look. I have focused on birth dates and places, but it is obvious that the idea is to locate at least one event in a particular location. The problem in finding your great-great-grandfather isn't really about him, it is about his children, at least one of whom survived to adulthood or you would not be here. There is one more rule, it may seem very cynical, but you have a much better chance of identifying the true mother of your ancestor than you do the true father. No matter how certain you may think you are, there is always a measure of uncertainty in any pedigree where the mothers are not positively identified. If you want to blindly ignore this principle, be my guest. If you don't know where a relative was born or where he or she lived, then you are skipping a generation. Focus on the children. Find out as much as you can about the children. Where and when were they born? Where did they live? On and on and on. Focus on those events and places where you can positively identify the time period in which they lived and the place. Look for records at that time and in that place. Instead of spending years looking for your great-great-grandfather, spend you time looking for your great-grandfather and finding your great-great-grandfather just might take care of itself. If you find no information, after making a reasonably exhaustive search, you may be at the end of your line. But I wouldn't think so. I know about only a very, very small number of people who have really searched all the possible records about an ancestor. Don't make comments about how hard it is to find the mothers, please! Ann Mohr Osisek: Ann taught genealogy for Orange County, Florida Adult Education for 19 years. Anna Swayne: Anna is a personal DNA Consultant for GeneTree.com and has coordinated several projects working through the Sorenson Molecular Genealogy Foundation located in Utah. Arlene H. Eakle, Ph.D.: President and founder of The Genealogical Institute, Dr. Eakle has more than 30 years experience in research and specializes in Southern States. DearMYRTLE: Best known for her DearMYRTLE Genealaogy Blog and the amazing assistance she offers to her readers. Has a home in both Virginia and Utah. Joan E. Healey, AG: Works as a research consultant at the world renowned Family History Library in Salt Lake City. Specializing in Midwestern states, American Indian, and African-American records and research. Ken Aubuchon: Founder and CEO of AGES-online, a web based service that allows you to build your family tree from anywhere there is an internet connection. Ken lives in Kansas. Lisa Louise Cooke: Producer and Host of the Genealogy Gems Podcast, an online genealogy audio program. Based in California. M. Bridget Cook: Author, speaker, and life coach whose autobiographical books have been featured on Oprah, Dr. Phil, and Good Morning America. Robert Scott Davis: Director of the Genealogy Program of Wallace State Community College in Hanceville, Alabama. He has written more than 1,000 publications records and resources to assist the genealogist with research. Thomas Jay Kemp: Director of Genealogy Products at NewsBank. Tom is a well known and highly respected genealogist. He has worked in the library field for 46 years. Tom currently lives in Connecticut. It is hard to find this much experience in any other place at the same time. 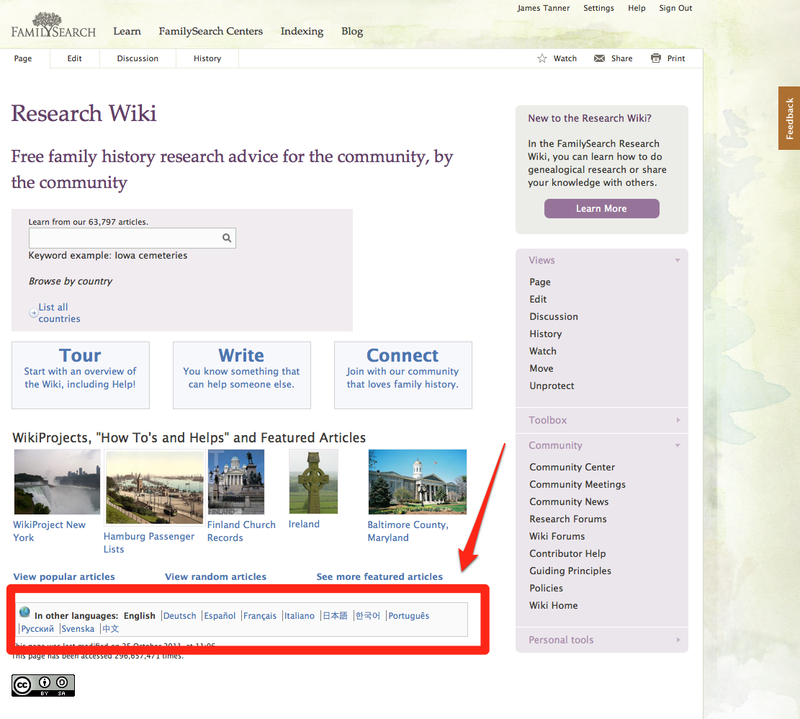 The FamilySearch Research Wiki now is available in many other languages other than English. The Wiki is now in German, Spanish, French, Italian, Japanese, Korean, Portuguese, Russian, Swedish and Chinese. There will be inter-language links between the various versions of the Wiki, but you can always use a program like Google Translate if you need to read a page in a language you do not know. This new list of languages just came up so I will probably have more information later when I have had time to look at each version. Through advertising and availability at the Family History Centers, Ancestry.com has apparently convinced nearly all of the researchers that they have the only "real" copy of the U.S. Census records. I know that this is not accurate, but I still find myself automatically going to Ancestry.com when I think of looking for U.S. Census records. I thought it important to point out alternate sources for digitized copies of the U.S. Census (some complete, some incomplete) and also make some comments on the use of indexes. First, it is a good idea to understand how the Census records came into existence. Why do I care? You ask. If the information is there, what difference does it make where it came from or how it was obtained? Would it help if you knew that census records were written by illiterate enumerators? That isn't true, but illustrates the reason you might want to know how and where genealogically interesting records come from. Let me give you a very, very common scenario. A person comes into the Mesa Regional Family History Center and says something like, "This is the first time I have ever done any research on my family, where do I start?" Almost always the first thing that almost automatically happens, is the person fills out a pedigree chart with some information and a volunteer sits with them at a computer and looks for Census records. A high percentage of the time, one of the ancestors shows up on the U.S. Census and the person is amazed, delighted, impressed etc. What is wrong with this picture? Even if the person is told by the volunteer that the information may not be accurate, they still have a copy of the U.S. Census record and now believe it to be the TRUTH. Now all of you out there in bloggingland know that the U.S. Census is not a primary source for information like birth dates and so forth, but almost no one understands that principle until they have spent a long time doing research. Hinckley, Kathleen W. Your Guide to the Federal Census for Genealogists, Researchers, and Family Historians. Cincinnati, Ohio: Betterway Books, 2002. Dollarhide, William. The Census Book: A Genealogist's Guide to Federal Census Facts, Schedules and Indexes : with Master Extraction Forms for Federal Census Schedules, 1790-1930. Bountiful, Utah: Heritage Quest, 1999. The Dollarhide book is available online as part of the Help menu in the Heritage Quest data base. Heritage Quest may be available for free through your local library. The book is buried down in the levels of the Help menu. Yes, Ancestry.com does have a "complete" set of images and indexes of the U.S. Census from 1790 to 1930 (soon to have 1940). $ but free in Family History Centers and some libraries. 1880 U.S. Census is free. FamilySearch.org has the U.S. Census from 1850 to 1930 with indexes for all the years but no images for 1860, 1880 or 1930. Free. See Ancestry.com for images in 1880. Archive.org (The Internet Archive) has a complete set of images from 1790 to 1930 but no indexes. When I say complete, I mean complete. If you are used to looking at the other U.S. Census images, you really need to look at The Internet Archive. This is a complete copy of the National Archives Microfilm including all of the introductory material and instructions. You may never have known what you were missing. Free. Census Finder has a search engine to find online Census records not in the other collections. Free. African America Census Schedules Online. Partial but complete in some areas for some years. Free. Did you know you can still see the images on microfilm at the Family History Library and some Family History Centers? Did you know you can order copies of the microfilm of the U.S. Census from the National Archives? Now about indexes. Why do you need one? Do you trust the index? Do you assume that your ancestors are not in the U.S. Census when you don't find them in the index? Do you know where your ancestors lived? Do you automatically search the entire town records for other family members in small towns? What did genealogists do before the indexes were available? Answer those questions and you can see why the collection of images by Archive.org is so valuable. If your direct line ancestors increased geometrically, i.e. 2, 4, 8, 16, 32, 64 etc. In 15 generations you should theoretically have 32,768 great (back 15 generations) grandparents. By the time you got back 30 generations you would have 1,073,741,824 grandparents just in that generation. That's well over a billion grandparents. Obviously, how far back you go in 15 or 30 generations depends entirely on the age and the time to when your ancestor was born. If all the mothers had your direct ancestor child at 14 the least time period in which you run up 15 generations would be 15 X 14 or 210 years. But most of us have great-grandparents that lived well over 100 years ago. I have a great-grandparents who were born before the Civil War in the 1850s. A more realistic time period for each generation is around 30 years. So 15 generations would take you back at least 450 years. In my actual pedigrees, if I count back 15 generations, my ancestors were living in the late 1400s. Now, if you think about this for a minute or two, you will quickly see that identifying over 32,000 people in the 1400s is likely impossible even if you don't take into account pedigree collapse. Pedigree collapse is an absolute reality. It occurs whenever one of your ancestors, knowingly or unknowingly, marries someone to whom he or she is related. The effect of this is that the actual number of ancestors is far less than the theoretical large number. In my line, my parents were second cousins, that is they share a common Great-grandfather. So my pedigree begins collapsing quite early. If you have done your genealogy back a number of generations on all your lines and have yet to identify one instance of pedigree collapse, then you are probably ignoring duplicate individuals in your pedigree. So when can you expect to reach the maximum number of ancestors? Some estimates put the time frame around 1200 AD. See Wikipedia:Pedigree collapse. If this sounds unlikely, just think of all of the pedigrees tracing their lineage back to the same set of royal ancestors in Europe. In another example, I was talking to one of my friends yesterday about his genealogy and he mentioned that his brother was doing research in Denmark and that it was very difficult to impossible. I was very surprised, because Denmark is one of the most organized and documented countries in Europe. I asked how far back he was looking and he said back in the early 1600s. Oh, well, that explained the problem. It was not a difficulty with the records, it was a difficulty in finding any records before 1600. For example, the earliest records for Denmark in the FamilySearch Historical Record Collections date from 1618. Given all this, I began to wonder how much effort is going into search pedigree lines that either fall into the category of collapsed pedigrees where the research doesn't realize the relationships or situations where the absolute number of ancestors has been reached and there are no more records? In this regard genealogy is sort-of like collecting stamps, there is is an actual finite limit to the number. You may never have enough resources to collect every single stamp, but you can get the vast majority if you want to spend the time and money. Just like with stamps, genealogy has a practical and finite limit. The further back you go, the more likely you are to be required to spend a lot of time and resources on each incremental acquisition. But there is still a practical and finite limit to how much information you can find on any given line. OK, so should we all just throw our hands up in the air and quit? No. Very, very few people, given all the researchers in the world, ever reach the practical, much less the theoretical limit of their research activities. But if you don't recognize some of these limits, you might not allocate your resources in reasonable ways. So what is the strategy for extending a line? Especially a line that has reached or nearly reached the theoretical or practical limit. There are a lot of posts and other articles on the so-called brick wall problem. I have a some additional thoughts about that problem, but that is another post. The United States' copyright law is based on the U.S. Constitutional provision in Article 1, Section 8 which says that Congress shall have the power, " To promote the Progress of Science and useful Arts, by securing for limited Times to Authors and Inventors the exclusive Right to their respective Writings and Discoveries;"
The power to regulate copyrights is vested in the Federal Government. Section 1338 of Title 28 of the United States Code confers upon the federal district courts exclusive jurisdiction over claims of copyright infringement. The cost of bringing a lawsuit in the Federal courts can be prohibitive. But there are statutory remedies. Quoting the Statement of the United States Copyright Office before the Subcommittee on Courts, the Internet, and Intellectual Property, Committee on the Judiciary, in the United States House of Representatives, 109th Congress, 2nd Session, March 29, 2006 "Remedies for Small Copyright Claims:"
Of course, there are provisions built into the copyright law that are designed in part to provide even the copyright owner of modest means with a reasonable prospect of recovering not only compensation for infringement but also the expenses of litigation in a successful infringement suit. Unlike most areas of the law, copyright law permits a court to award a reasonable attorney's fee to a successful plaintiff (or defendant). Moreover, a copyright owner may elect to receive an award of statutory damages of up to $30,000 per infringed work—and up to $150,000 per work in cases of willful infringement—in lieu of actual damages and profits. (citations omitted). Unfortunately, rarely will an attorney take a copyright case on contingency. One way to reduce the individual cost of bringing such a suit is to have several parties act together to make their claims. Copyright law is not by any means unique to the United States. There is an international copyright law and 164 countries have signed the treaty creating the law. The law is called the Berne Convention for the Protection of Literary and Artistic Works, usually known as the Berne Convention. This international agreement governing copyright, was first accepted in Berne, Switzerland in 1886. See Wikipedia:Berne Convention for the Protection of Literary and Artistic Works. Over 100 years later, on March 1, 1989, the U.S. Berne Convention Implementation Act of 1988 was enacted, and the United States Senate ratified the treaty, making the U.S. a party to the Berne Convention. Copyright is a good news/bad news type of law. The good news is you have plenty of statutory and case law support to make a copyright claim. The bad news is, as I said above, the cost of doing so may be prohibitive. This is especially true if the copyright violator is outside of your country's jurisdiction. Although copyright registration with the U.S. Copyright Office or the corresponding agency in your country, may not be necessary for protection, it is necessary in the United States as a prerequisite to bringing a copyright infringement suit in the Federal court. Another major issue with copyright cases is the venue of the case. Although, in the U.S., all of the Federal District Courts have jurisdiction over a copyright case, the real issue is the venue, or which of all the courts will be the one to hear the case. Some cases have held that the venue for hearing a copyright case is the place where the copyright holder resides. See Brayton Purcell, LLP v. Recordon & Recordon v. Apptomix, Inc. and Jonathan Lee, 575 F.3d 981 (9th Cir. 2009). But that is not a universally held decision. If you are at all contemplating filing legal action as a result of an alleged copyright violation, it is absolutely essential that you obtain competent legal advice. Most of what you read or hear about copyright law is vastly oversimplified and can be misleading. On the other hand, it is just as expensive for the violator to obtain legal counsel to defend against a lawsuit. Unless they are predatory and living in a country that is not a signatory to the Berne Convention, most copyright claims with which I have been familiar end up with the removal of the publication causing the copyright violation. Although allowed, in my experience, monetary damages are most uncommon unless the copyright holder is willing to go all the way in the court system. Although, I am a licensed attorney practicing in the State of Arizona, what I have written should not be construed to be legal advice about any particular claim or controversy. You are encouraged to seek competent legal advice if you are the victim of a copyright infringement. 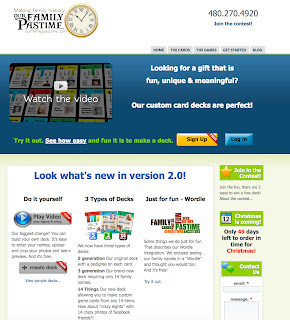 Copyright Violation Notice: Please be aware that the publication of the __(insert description)___ is a violation of the copyright owned by ___(insert the name of the owner)____ and violates Title 17 of the United States Code (if you live in another country, you can insert the law that governs copyright in your country). Your violation of the copyright may result in legal action and could result in a claim for monetary damages. Continued publication of this copyrighted material will result in additional claims and damages. You are requested to remove this ____(insert what should be removed) immediately. There are lots of different wording that might be used. I do not think it is productive to threaten legal action, unless you are actually intending to file a lawsuit. However, you can certainly notify people that their actions could result in legal action. Here is a link to a very good discussion about what to do in the case of a copyright violation. Do not just suffer. Be proactive. You may or may not be aware of the leeches of the blogging world. These are websites, set up like a personal blogging site, that intentionally copy content from other blogs and republish it without permission and sometimes without even mentioning the source. This activity is called splogging (a contraction of spam and blogging) and it is clearly a violation of the U.S. Copyright Act. Some sploggers must think they are performing some kind of service by "promoting" other's blog posts, but their activities are highly destructive because the posts are reproduced in their entirety and therefore the splogger is stealing the primary blogger's traffic. Sploggers usually have a whole series of bogus sites, sometimes hundreds or thousands, hoping to get enough traffic to make money from advertising. There is a dilemma in trying to stop the sploggers because if you give out their website address, you will be driving traffic to their site and doing exactly what they want. If you have even the slightest doubt that splogging violates the U.S. Copyright Law, and probably the law of dozens of other countries, all you have to do is read Circular 1, Copyright Basics from the U.S. Copyright Office. This free PDF download points out that copying any protected work, in whole or in part is a violation of copyright. To quote from the Circular: "It is illegal for anyone to violate any of the rights provided by the copyright law to the owner of copyright." In addition, copying material over the Internet is also a violation of the Digital Millennium Copyright Act of 1998 (DMCA). The splogger's use of a automatic copying program clearly violates Section 1201 of the DMCA. I does not matter that there is no copyright notice on the protected work, all works are protected regardless of whether or not there is a notice. This blog post is protected, just like any other on the web because it is an original work and I own the copyright. Providing attribution or even including the original bloggers name or a link to the original site does not prevent or excuse the violation of the copyright act. If you are reading this entire post on a site that is not one of the two that I use, Genealogy's Star and TechTips, you are reading a splogged version of my blog posts. Is there any way to be more clear about this subject? Do I have to begin bringing the specter of lawsuits into the genealogy community to stop the practice? I am not so naive to think that my threat of getting involved will stop the practice, but you can be assured that if I do get involved any claims I make will include claims for substantial damages. Historically, genealogy has had a difficult time being considered a legitimate pursuit because of the existence of rampant fabrication (aka lying) by its practitioners. Whether intentional or otherwise, fabrication is still a major problem. The proliferation of online user-created family trees has given those who are either too ignorant or too sloppy to verify information, an ample platform for their misdeeds. This would not be such a problem personally since I can just ignore the inaccurate information, if I didn't have those misdeeds of others constantly thrown in my face, as if I could somehow prevent my own grandfather's second wife being shown as his mother much less solve all the other problems online. One of my friends, who is just getting started in genealogy, recently took the time to tell me in detail what he thought about all the problems he had found on a popular online family tree program. This wouldn't be so bad if it didn't happen regularly. My comment about all this is that you can lie but you can't cheat. To put it bluntly, if your information is unsupported by competent citations to source material, it is easy to just assume that whatever you or anyone else has put online is inaccurate and suspect. If you try to justify your lack of support with bogus citations, it is extremely easy to determine that what you have cited is either wrong or nonexistent. There is always the possibility that original documents can be forged or doctored to support a claim, but there is usually more than simple interest in genealogy to support such extreme measures of misrepresentation. I have been told over and again that user submitted trees are "useful" for hints and suggestions. That may be true, but how do you tell the difference between pure fabrication and reality if you are always inclined to believe that those who submitted the information did so in good faith? Just today, I had two different people relate to me how the information they had on their own family lines was proving to be extremely misleading and mostly false. What is the point of having a poorly documented and inaccurate family tree? Some people may be motivated to document their pedigree if they find that the information given to them by relatives is false, but others may be so discouraged that they lose interest in genealogy altogether. One of the most common forms of cheating is to copy work done by someone else and claim it as your own. So the question is, how can you say you can't cheat in genealogy when people copy another's work all the time and claim it as their own? Simple, how do you know the work you are copying isn't also bogus and copied from someone else who fabricated the whole thing? If you don't verify the other person's sources, how do you know what you have? By this, am I condoning copying another's work and claiming ownership? Not at all. I am just saying that you cannot cheat your way into a valid, citation supported pedigree. Who do you think you are trying to impress and who do you think you can fool? The only way you can know that the work you are copying is legitimate is to verify it for yourself and if you do all the work to verify the facts, then using the information is, by definition, not cheating. Am I then advocating redoing all of the work done by others? Hmm. That is a really good question. What I usually say at this point is that you have to do enough verification to measure the level of reliability you have in the work, but regardless of your esteem for the person you are copying, you cannot rely on unverified sources. Does that mean collaboration is hollow? Or do I escape the problem by simply attributing the work? No, collaboration is not dead, nor is it hollow. Can you avoid the whole problem by passing the buck, so to speak, and attribute the source? Attribution is important, but not a panacea. There is no way around the dilemma. If you copy family history information and the copy turns out to be inaccurate, you are simply wasting your time. Many of my earliest memories are associated with music. Ours was not a particularly musical family, my parents did not play any sort of musical instruments, but I always remember places associated with a particular piece of music. If I hear the song, I will remember where I was when I heard it. When I was very young, the jukebox in the local town cafe played what we would now call country music. I can still remember hearing Hank Williams singing "On Top of Old Smokey" and Patsy Cline and others. One of my earliest memories is of a song called, Mister and Mississippi. The version I remember is by Tennessee Ernie Ford. The earliest known recording is now believed to be by a man named Edouard-Leon Scott de Martinville in about 1857 to 1860. Unfortunately, sound recordings did not become popular until Thomas Edison invented the phonograph in 1878. As genealogists, we now have a little over 100 years of recordings some of which may be of people in our family. Many of those recordings are on media that will likely become unreadable, if it is not already. For example, I have a sizable collection of dictation made by my father on micro-cassettes with a dictating machine. I have other recordings on wide loops of magnetic tape from another, mostly extinct, dictating device called the IBM Executary Dictation Machine using Magnabelts. Most of these have been transcribed or were transcribed before the equipment became nearly impossible to find. So how do you know what kind of music your ancestors listened to? Unless they wrote down their musical preferences, you probably will have a difficult time finding out exactly what they might have heard. One of my grandmothers left a sizable collection of sheet music from the late 1800s and early 1900s, I can take most of those songs and go to YouTube.com and put in the name of the song and likely find someone somewhere has recorded a version. It is fairly easy to find out what songs were popular during your ancestors' formative years. Even if they were non-musical, they likely had music in their local church meetings and many schools and other organizations have choirs. Why do you need to do this? For me, it is simple, music speaks to my soul. I can live with my ancestors through their music. One of the challenges of writing my life story, I would guess is including the thousands of hours of music I have heard and sung. 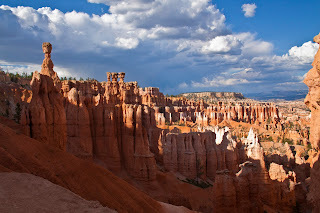 Since I was a young teenager I sang in Church choirs, one time even singing in the famous Mormon Tabernacle on Temple Square with a University of Utah LDS Institute Choir. Don't forget the music. One of my friends developed a new concept in card games, overlaying the more traditional cards used for a variety of other card games, like Rook, with a genealogy theme. 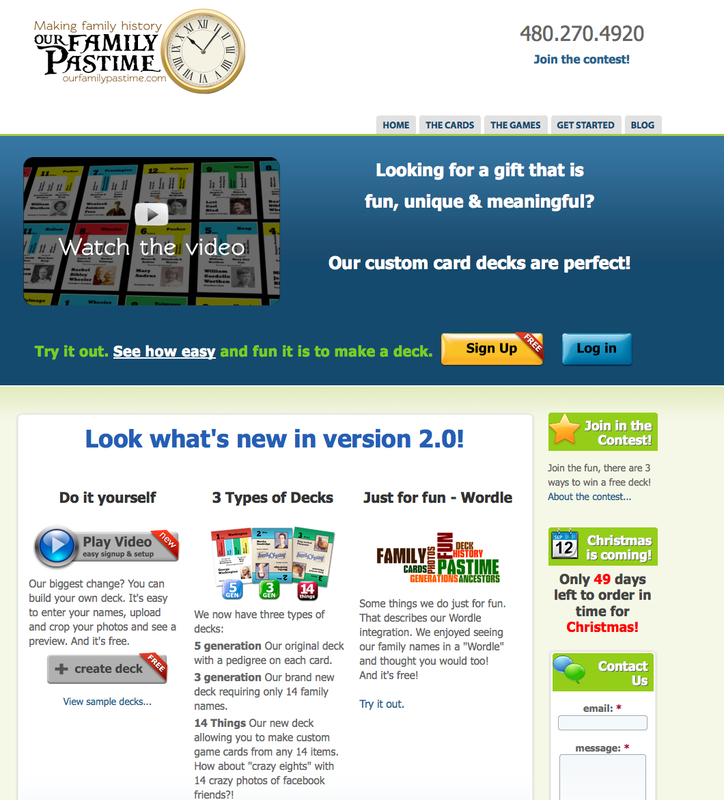 The company is called "Our Family Pastime." I am aware that there are other card games out there in the genealogy world, but this one make a personal statement, with pictures of your own family on the cards. Of course, there are games you can play using the genealogical information, but the cards also work in the more general context of card games. Quoting from the developer of the game concept, "The concept of turning family history "work" into family "fun" was good. The idea came because I so love my ancestors and their stories and it just broke my heart that many in my family just didn't see how exciting and fun it is to know about them. I knew if they learned about them then they would find out like I did. So I figured out how to do what our family loves to do and inject something that might peak their interest." Now, before we get into a long discussion about the relative merits of card games, I need you to know, I don't play games. Period. This all started back when my children started to become teenagers and turned out to be much smarter and much better game players than I am. I figured there was no reason to play a game when I would always lose. They really enjoy playing against each other because they are all competitive and smart. My grandchildren also play a lot of games and this looks like one they might not exactly like at first, but would warm up to. I appreciate anything that actively promotes genealogy, of course. My daughter-in-law was putting together a deck for her mother's parent's ancestors. She commented to me that she had heard these names her whole life but never really knew how they were connected. She said "it really works!". There are 56 cards, 14 cards with 4 suits (the four suits are colors but they are also paternal gfather, paternal gmother, maternal gfather and maternal gmother). 14 is a great number as it represents the number of people in three generations of couples, 2 spouses, 4 parents, 8 grandparents. Each card, of our 5 generation decks, displays a 3 generation pedigree. One of the surprising things I found was how amazed the family is at all the names they are related to. Since I include the grandparents surname at the top of the card. That is a fun discovery for them. Our biggest improvement has been the ability to allow people to create their own cards, it allows us to charge much less than earlier. We added a 3 generation deck since obtaining the 62 names needed for the 5 generation was tough for some. The games are the same they just don't have the pedigree on each card. In my family, we have created a sheet of cousin pictures. Our family is so wide spread across the U.S. that we seldom see each other. So the cousin pictures are used by the parents to help the younger members of the family have a sense of belonging. I guess I liked the idea of the cards because of that reason. Preserving the image or the artifact? Digital technologies are changing both how library materials are accessed and increasingly how library materials are preserved. After the Internet Archive digitizes a book from a library in order to provide free public access to people world-wide, these books go back on the shelves of the library. We noticed an increasing number of books from these libraries moving books to “off site repositories” ... to make space in central buildings for more meeting spaces and work spaces. These repositories have filled quickly and sometimes prompt the de-accessioning of books. A library that would prefer to not be named was found to be thinning their collections and throwing out books based on what had been digitized by Google. While we understand the need to manage physical holdings, we believe this should be done thoughtfully and well. (Some links omitted). The Library of Congress post raises a slightly different issue by asking the question, "So what level of resolution is needed to capture the image information from a negative? This has been a vexing problem for many of us during the last two decades of digitization projects, partly because we have not adequately thought through the distinction between informational and artifactual capture." Are we all fooling ourselves to think that a 300 dpi .tiff file scan is sufficient to "preserve" the document? I have been monitoring the discussions going on in the digital preservation world and I think it is time that the genealogical community started to become more involved in the discussion. Using your smartphone to take pictures? 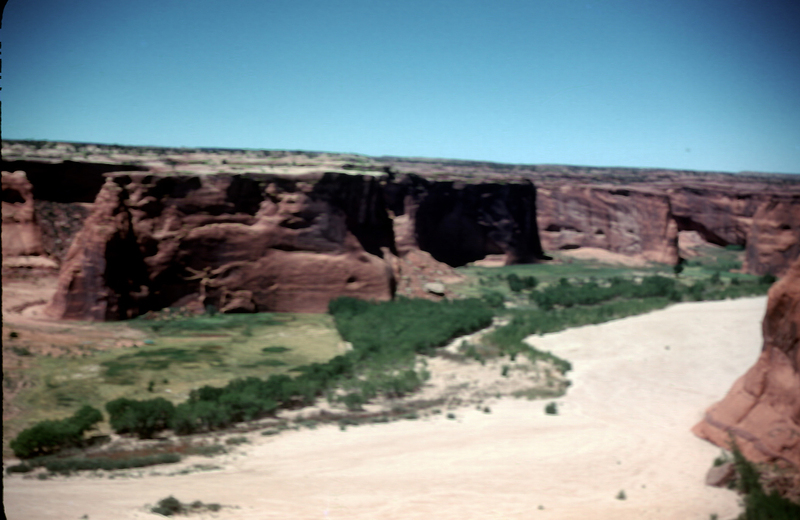 This is a really, really bad picture of Canyon de Chelly. For as long as I can remember there have been cameras and then there have been "cameras." What I mean by this is that during my lifetime there have always been very inexpensive (cheap) cameras and very expensive professional level cameras. The cheap camera sometimes took almost acceptable pictures as long as there was enough light and you really didn't want to see anything except a blob of people. I took the above picture when I was about twelve years old. If I had owned a decent camera, the picture might have at least been in focus. The other major problem with the picture is what is called vignetting, or a fall off in the the light around the edges and in the corners of the picture. This extreme example is caused by a poor quality lens. Some of the other problems with the picture are my own fault, the picture is not straight and although the subject matter is spectacular, the composition and choice of subject are sadly lacking. So there are really two important components to taking pictures, the equipment and the photographer's ability. Now, lets fast forward to today. Fifty-five years later, technology has changed considerably. I no longer use film in my camera. But could I take the same horrible picture today? Umm. Maybe I couldn't but that doesn't mean that the same problems don't exist, but just on a different scale. All the camera equipment in the world wouldn't make that picture of Canyon de Chelly any better but perhaps a little experience and knowledge about composition and subject matter might help. This reflective travel back into the past came about as a result of the release of the iPhone 4S. iPhones and smartphones in general have become the "Instamatic" of the modern age. The number of people carrying around cameras has never been greater. The new iPhone 4S has an 8 Megapixel built in camera. I ran across a side-by-side comparison between the new iPhone and a very expensive professional level Canon 5D Mark II. You might want to take a look at how the two cameras compare in quality. The Canon Camera and lens are more than 18 times as expensive as the iPhone 4S at $200. By the way, the side-by-side pictures are really bad from a composition and photography standpoint. So are we now to the point where a cheap (relatively) camera is as good as the most expensive models? (The Canon 5D Mark II is not even close to being the most expensive camera, by the way). For one thing, having a cheap camera that takes good quality pictures will certainly help. But what about genealogists, don't we need fancy equipment to do serious photography? That is a good question. As soon as I get my back ordered iPhone 4S I will do some comparison between the smartphone camera in my present iPhone 4, the new iPhone 4S, a point and shoot camera like the Canon PowerShot and my Canon 5D Mark II with an L-series lens. How do you think all this will come out? Will we all throw away our expensive cameras and use our smartphones? In writing this post, please understand that I have not been given any "confidential" information by anyone associated with FamilySearch. If the information is not entirely correct it is due to my own observations and conclusions, not those of FamilySearch. It is my firm rule never to breach a confidence. If I am told information about any subject, even in casual conversations, that I believe to be privileged or of limited distribution, I will not repeat that information until it is made public. On the other hand, if I am able to learn information from "public" sources that I have not been told about in private conversations, then I feel free to report my findings. I do understand the need to have "private" or "confidential" beta tests of new products. In most cases this is due to the intense competition between commercial vendors. Participants in these types of beta tests are usually obligated to sign a legally binding non-disclosure agreement. Since FamilySearch is not a commercial vendor and since the FamilySearch products are not in competition with any other products in the marketplace, I would assume that the confidentiality of the Beta test of a new product is maintained to avoid unreasonable expectations on the part of potential users for features that may not work as originally expected. Otherwise, I further suspect that the "confidentiality" is merely a reflection of the overall computer industry and serves no real practical purpose. Family Tree is currently available to a limited Beta test audience. It is a service that allows you to work with the community to build a common family pedigree. There is a small image showing a pedigree outline, apparently a screen shot of the program. If you try to click on the link to Family Tree, you will get a screen saying "You are not authorized to view this page." It is my understanding that the Beta test invitations may be already going out to the community at large. I believe that the participants have been chosen somewhat randomly and will receive an email invitation. I suspect they could pass that invitation along to someone else if they chose to do so. If you have an invitation, when you login to FamilySearch.org, you will have an extra menu item called "Family Tree" that will allow you view the new program. In reality, the existence of developments of a new version of New FamilySearch is not new news. There is a widely circulated document called, "The Case for Moving to "Our Tree" A FamilySearch White Paper" dated April 2011 that lays out the entire plan for modifying New FamilySearch into a source oriented, user editable format. Underlying the discussion is an assumption that the evolving New FamilySearch product or Family Tree, will become more wiki-like and less like the existing New FamilySearch program. It is difficult to assess how much cross-program feedback there is in FamilySearch. It sometimes appears to me that the various sections, such as those working on the FamilySearch Research Wiki, those working on the FamilySearch Forums, those working on Indexing and so forth, have very little interaction and in fact no almost nothing about other sections' operations, goals or even their products. I have not entirely given up on the present version of New FamilySearch, but I can say that I have been looking for viable alternatives to archive my own information online and that my search, so far, has not included New FamilySearch. I certainly hope that Family Tree becomes a viable online alternative for collaboration and maintaining a realistic family history database. Normally, I don't just pass along things that I find on the Internet, but about 4 million or so people are now getting to know a computer personality called Siri on the Apple iPhone 4S. My first introduction to an attempt at artificial intelligence or natural language programming was a program called Eliza on the Apple II. ELIZA was named after Eliza Doolittle, a working-class character in George Bernard Shaw's play Pygmalion, who is taught to speak with an upper-class accent. Wikipedia: Eliza. The program would respond to questions by parsing and substitution of key words into canned phrases. The program predates personal computers by several years and did not use speech but typed questions initially on a teletype machine. I found a recorded conversation with the iPhone 4S by Lary Magid on cnet News called appropriately, An interview with Siri (podcast). Although the responses from the Siri program on the iPhone 4S are much more elaborate than the canned responses from the ancient Eliza program, some of the same features show up in the iPhone iteration. It is obvious in a few seconds of conversation that Siri is not much closer to successfully passing the Turing Test than Eliza was back in 1982. All of our Apple computers have spoken to us for years. If you have voice alerts selected, the computer will read all of the alerts that appear on the screen. It is only mildly irritating, not nearly as irritating as the old Nissan voice warnings about open doors and lights on that came with Nissan automobiles in the 1980s. I have a rule not have cars talk to me. I am ambivalent about computers. I am waiting to see if I can stand having a talking phone. I am currently on the waiting list for iPhone 4S, all of the stores in the Phoenix area sold out their inventory by Saturday afternoon. When I got to the store, they had one white model left and it sold while I was in the store. When the iPhone shows up, I will probably have a few more comments. Hopefully, something in this new phone will help or at least apply to genealogy. Despite the media detractors who once again predict a failure for the introduction of an Apple product, the iPhone 4S introduction shows that Apple knows the market better than it knows itself. Predictions are that Apple will sell over 4 million iPhone 4S devices in the first weekend of sales. Part of the reason is greater availability of the product. The phones are available not only at Apple stores, but also at BestBuy, Target, Sam's Club, and Radio Shack. The iPhone 4S will also be available on Sprint Nextel as well as AT&T and Verizon. Even though the device itself the is big draw, the real change is the release of the iOS 5 operating system. Even existing iPhone 4 owners can upgrade to the new system. The iPhone 4S introduces voice activated controls called Siri, a dual-core A5 processor chip that is much faster than its predicessors, an all new 8 Megapixel camera with HD video, and connection to the iCloud, online storage system from Apple. The new operating system, i OS 5, the heart of the product, has over 200 new features. What makes the device great is the software and that means the operating system. Unless you just don't care about computers or don't use one, you should be aware of the fundamental convergence of the operating systems. What this means is that with Apple leading the way, the way we use and interact with computers is rapidly evolving into the model used by iPhones and iPads. You don't have to look at the upcoming Windows 8 to realize that Microsoft is being copy cat again and trying to catch up to Apple's innovation. By the time Windows 8 comes out sometime next year, its "revolutionary" interface will be old news. I downloaded iOS 5 to my iPhone 4 recently. You need to synchronize your iPhone to your computer before you do the free upgrade. Of course, the new iOS 5 will work best with the new iPhone 4S, but it upgrades existing phone also. iOS 5 is compatible with the iPhone 3GS, the iPhone 4 and the iPhone 4S. Now what do I mean by convergence? All of the innovation is operating systems, whether it be Apple's iOS 5 or the new Android systems focus on hand controls. When was the last time you hooked up a mouse to your smartphone? It is inevitable, as shown by the features of the planned Microsoft Windows 8, that operating systems are moving towards or converging on a common operating model with involves the use of hand controls. Apple's new iOS 5 for the iPad 2 that adds hand gestures using four and five fingers. As tablet computers such as the iPad become ubiquitous, computer users will begin to accept hand control systems even more than they already have. A few days ago, I watched two of my grandchildren demonstrate the gesture controls for their Xbox 360 game console using Kinect Core games. It is easy to see that it will not be long before you control your computer with hand gestures either on the screen or in front of the screen. The new iOS 5 has some very useful and interesting features. In addition to the multitasking gesture control, there is a new notification center that will collect all of your emails, texts, friend requests and more into one simple screen. iMessage lets you send unlimited text messages via WiFi or 3G from your iPad, iPhone or iPod touch to anyone with one of those devices. The new Reminders App gives you a centralized to-do list that is synchronized automatically through the iCloud and Twitter is integrated right into the iOS 5 operating system! There are enhancements to the camera and photos. One dramatic change is that with iOS 5 you no longer need a computer to keep your iPad, iPhone or iPod touch up-to-date. You can activate and set up your device wirelessly right out of the box and download and update all of your Apps without connecting to a computer. The only constant in life is change and the only constant in computers is revolutionary change. I have heard that FamilySearch will have a new service available at the upcoming Family History Expos event in Georgia. They will have a station with a scanner and software available for attendees at the Conference to scan their own documents including books. This is a trial service and could be incorporated into future conferences if it works in Georgia. Knowing the limitations of software and hardware, I hope this happens. We have been talking about offering a similar service at the Mesa Regional Family History Center for some time now, but have yet to get the project off the ground. I do see a need to offer people the experience of digitizing documents and books for their individual use. From a practical standpoint it offers no more challenges than having a copy machine available for public use. 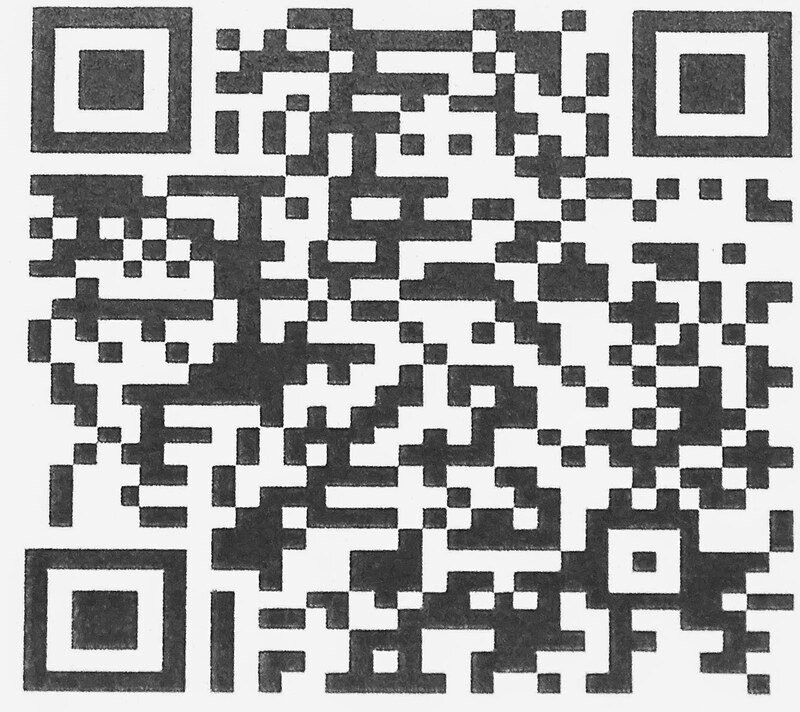 I hope this scanning program by FamilySearch gets off the ground, so to speak, in Georgia and maybe it will show up at future conferences. I hope the genealogical community recognizes the extremely valuable service provided by the Family History Expos. Although there are several major genealogical conferences throughout the year, Family History Expos has been in the forefront of bringing high quality professionally staged conferences to a variety of venues throughout the United States. I have participated in the Expos in the past, mainly here in Mesa, Arizona, but I am now looking forward to more involvement. Right now, I am scheduled to present in Yuma, Arizona on January 17, 2012, then in Mesa, Arizona on January 20, 21, 2012 then again in St. George, Utah on February 24, 25, 2012. I will also be attending all of those events as a blogger and reporting on the proceedings. If you have never attended a conference or are a regular attender, you will benefit from the Family History Expos' mix of basic to advanced presentations. Hope to see you at a future Expo! What do I mean when I say "research?" The word "research" as in "genealogical research" is often used so broadly as to almost have no meaning. I am going to discuss the topic and put the concept of research into a little better focus. In a more narrow and practical sense, research involves searching for information or data that is presently unknown to you. You might use the term research for looking up the price of a store item online. You say, the price is the unknown, my search online is research. In the genealogical context, I don't know my great-grandfather's name, I search online and find his name, that is research. I would disagree and would like to bring he concept of research a little further from simply looking up information you suspect is already there. You probably would not go looking online for the price of a computer if you didn't already know that the stores listed their prices online. Looking for your great-grandfather's name is not exactly the same as looking for a price online, but it can be about the same. What if your grandparents are still alive? Is looking for your great-grandfather's name online still research? If you were going to do research for a Ph.D degree, you would have to demonstrate that what you were researching had not already been done before. I am not advocating that doing genealogy is like getting an advanced university degree, but I think the term "research" should at least be limited to apply to those situations where you are discovering information that was not easily obtainable or generally known. Before you can do "research" you have to know what is already known and have a good idea of what is not known. When I use the term, I understand research to pertain only to the unknown, not the known. Finding out what is known is part of the research process but it is not research. In genealogy we talk about doing a survey before beginning to do research. I find many genealogists are stuck in the survey stage of the genealogy process and have never made it to doing research. What is tragic is that they don't know they haven't made it out of the survey process and think they are doing research. I don't want to minimize the difficulty of the survey step in the research process. It is not easy to find out what has been done. Before computers, I spent more than ten years off and on in the Salt Lake Family History Library before I had a reasonable idea of what work had been done on my family and before I could even start to do what I considered to be research. As they say, your results might be different. You might run out to the end zone of the survey step in a very short time. On the other hand, you may wrongly THINK you have finished the survey and not have the slightest clue as to the extent of the genealogical research done on your family. Upon reflection, completing an adequate survey of the information readily available on your family could even be harder than it was years ago because of the proliferation of places to look. For an example, when I did my initial survey, I had no way to determine if there were any surname books available about my family. In fact, I was only vaguely aware that there might be more surname books than the two or three I had in my own library. Years into my initial survey, I found several other books about my family that I had no idea existed. I recently found a reference to another book that shows up in one library in Florida and is not available on Interlibrary loan. Unfortunately, the book is listed online at more than $100 and I am not sure that any of the booksellers actually have a copy or are just fishing for sales. But the fact that I know the book exists wouldn't have even been possible before the Internet. The key to knowing when the survey step is over is contained in the phrase "reasonably exhaustive" which I borrow from the Genealogical Proof Standard. An exhaustive search will review every possible source tempered by the modifier "reasonable" that means you will not have to go to the ends of the earth, just to as many places as you can afford. How do I know what is reasonable? If your ancestors came from New England, the word "reasonable" would have an entirely different meaning than if they came from Eastern Europe in the last ten years. How will I know when I am moving on from the survey stage to doing research? The easiest answer is when you stop finding information about your family in secondary sources and online family trees. I really do need to diverge here a little and point out that finding an online family tree that takes your family back generations without specific supporting source documentation is a trap. There is always the remote possibility that the information is accurate, but lack of source citations is a clear indication of lack of support for claimed relationships. I have posted about this problem before, but it bears repeating that absent source citations, there is not any way to substantiate or believe a user contributed family tree. Back to the issue of coming to the end of a genealogical survey. Research is a process not a destination. At any moment you may find information about your family that puts you back in the survey stage. Too many researchers find a "new ancestor or ancestral line" and take off copying out the information without redoing the survey with the added information. Once you have made a connection with the new family line, you should immediately go back to looking for what might have already been documented about the new (to you) family members. Let's start with the assumption that you know nothing at all about your family except your parents' names (and you might not know that much). Almost ever guide ever written about genealogy will tell you to start with your own records and those available from family members. I am not going to worry about the situation where you don't know either of your parents right now, your research may start immediately. In the first case, a reasonable search included asking relatives for names and identifying information. In our electronic age, a survey may also included doing a reasonably exhaustive search on the Internet. 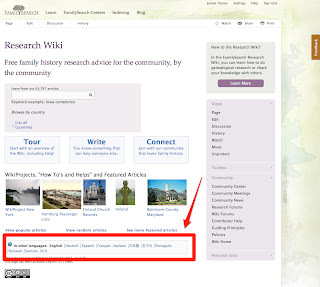 If you don't know where to start, start with any of the websites, including the FamilySearch Research Wiki, that give you instructions on where to look for your ancestors. At some point, you are going to realize that you have looked at everything you have in your personal documents. When you are satisfied that you have looked in all of the places you reasonably expect to find documents or source material, then you may be ready to start the research phase of your search.You will know you are into the research phase when you stop finding information that is already available from some other member of your family. How do you join the genealogical community? A genealogists friend here in Mesa posed a problem he was worrying about. Over the years he had contact with an acquaintance in the eastern part of the U.S. Recently, this lady told him about her sister who had been working on her family history for ten years or so. Both of the sisters were now very old and the one who did the genealogy is incapacitated. The problem was that the sisters have this huge genealogy file and do not know what to do with it. My friend was concerned that all of the work would be lost and wanted to know if he should try to persuade the sisters to put the research online? This issue reminded me of my earlier thoughts on the genealogical community. Losing this file containing years of work will be one of those genealogical tragedies, made even more of a tragedy by the ease at which the file and all of the accompanying work can be preserved. Behind this tragedy is the loss of a potential member of the genealogical community. If these ladies had taken the time or made the effort to become involved in the community, someone would have been ready and very willing to help them preserve their family records. My friend is worried because there is little he can do from almost all the way across the country. He is not a close friend of the family and is worried that his efforts to help may be misinterpreted. So when or how do you "join" the genealogical community? Let me suggest that involvement with others interested in the same goals that you have in researching your family qualifies you as a member. There are no dues, no logins or passwords, it is the act of participation and sharing that constitute the community. These ladies are definitely not part of the genealogical community. Had they been part of the community, the question of sharing the research would have been resolved long before the sister became incapacitated. How do you find the community? Let me suggest that there are many ways. Online you can immediately be part of the genealogical community by participating in hundreds of ongoing, online social and research efforts. They encompass the entire spectrum of genealogical activities. You can start by putting a family tree online in dozens of public or private venues. You can participate on Facebook, Google+ or many other socially oriented websites and programs. You can find the nearest Family History Center and ask for help or even volunteer to help. You can find a local genealogical or historical society and even if you don't join, you can find people with similar interests who can help with suggestions concerning sharing and preserving your research. You can take research courses online, attend a genealogical conference or some other activity. There are dozens, perhaps hundreds of ways to become involved. Nearly all of these paths to involvement can provide a solution to the problem of preservation. I suggested he call one of the local Family History Centers where they lived and see if someone could contact them about helping to preserve the file and research. If they don't feel comfortable with someone from a Family History Center, then perhaps someone from a genealogical society or other organization might help. I just hear about these problems most of the time, I give advice but almost never hear the end of the story. Let's just hope this one turns out for the best. When you write a genealogy blog, researchers automatically assume that you can solve their most difficult ancestral problems. I regularly have conversations that start out with, "We have been looking for this ancestor for ____ years and have run out of ideas." Interestingly, there always seems to be more places to look, but when I make suggestions, I often get blank or even negative stares. It seems like there is a whole generation of would-be genealogists who don't want to look for documents past FamilySearch and Ancestry.com. Let me give you a few suggestions of place I find have been entirely overlooked. First on my list of overlooked resources are city directories. Even before there were telephone books, there were city directories. Don't forget their close cousins, the insurance maps. One of the mistakes made by novice researchers is assuming the if a directory isn't listed online, it doesn't exist. Some of the places you need to look are larger libraries in the state you are researching. It is also important to check with the state archives and/or the state historical society. On one visit to the Utah State Archives, I discovered that they had shelves of city and town directories dating back into the early 1900s and even the 1800s. Just one or two examples, in searching the Utah State Archives, I find Cemetery Burial Records for the city of Provo, Utah going back to 1849. The pioneers arrived in the Salt Lake Valley in 1847! Very, very few of these types of records have been digitized and are available online. Face it, you have to make arrangements to visit the archives. Another example, here is what is listed in the Ohio State Archives: Birth Records, Census Records, Death Certificates, Death Records Index, Land Entry Records, Marriage Records, Military Records, Military Rosters, Naturalization Records, Genealogy Workshops, and more. In additional they offer some great special collections, including African-American Experience in Ohio: 1850-1920, Civil War Collections, and OhioPix an online image gallery. You don't have enough time left in your life to even look at all the records available, so you better get started. Preserving the British Library's C19 Newspaper Collection with Planets: A short film. Planets (Preservation and Long-term Access Through Networked Services) has released the first of four filmed and written studies to show how national libraries and archives in Europe are using Planets tools to preserve large and valuable digital collections. DigitalPreservationEurope (DPE) fosters collaboration and synergies between many existing national initiatives across the European Research Area. DPE addresses the need to improve coordination, cooperation and consistency in current activities to secure effective preservation of digital materials. Digital preservation is a set of activities required to make sure digital objects can be located, rendered, used and understood in the future. This can include managing the object names and locations, updating the storage media, documenting the content and tracking hardware and software changes to make sure objects can still be opened and understood. Digital objects are much more 'fragile' than traditional analogue documents such as books or other hard copy mediums. Digital objects are fragile because they require various layers of technological mediation before they can be heard, seen or understood by people. Digital objects are also much more venerable to physical damage. One scratch on CD-ROM containing 100 e-books can make the content inaccessible, whereas to damage 100 hard copy books by one scratching move is - fortunately - impossible. A flash memory stick can drop into glass of water or get magnetized, portable hard drive or laptop can slip from your hands and get irreparably damaged in a second. Digital objects require pro-active intervention to remain accessible. While you can put a book on a shelf and return to it in upwards of 100 years and still open it and see the content as it was intended by the author/publisher, the same approach of benign neglect to a digital object is almost a guarantee that it will be inaccessible in the future. Genealogists, especially those with huge investments of time and energy into large database files need to be not just interested, but obsessed with digital preservation. All this reminds me, it is time to migrate my files again.